The next issue of the Transport Action Western Newsletter is in final editing and will be completed on Saturday. Paper copies will be mailed next week and email subscribers will receive theirs as soon as this weekend. The Western Newsletter combines news from both Transport Action BC and Transport Action Prairie. and much more that I can’t remember right now. The provincial study on the future of the Esquimalt and Nanaimo Railway (now owned by the Island Corridor Foundation) on Vancouver Island was released recently. The summary of the study basically concludes that it is not worth investing any money in the railway corridor. The full study can be found on the BC Ministry of Transportation site. The E&N railway is now owned by the Island Corridor Foundation. 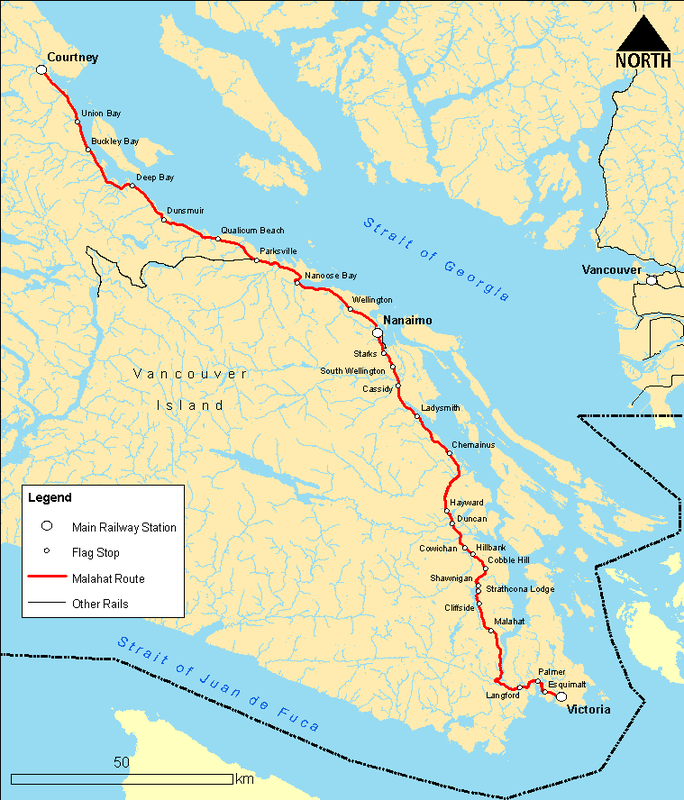 Rail service is contracted to the Southern Railway of Vancouver Island. Freight service only exists along part of the line between Courtney and Duncan. There is one round trip passenger train every day from Victoria north to Courtney and a return trip to Victoria in the afternoon. 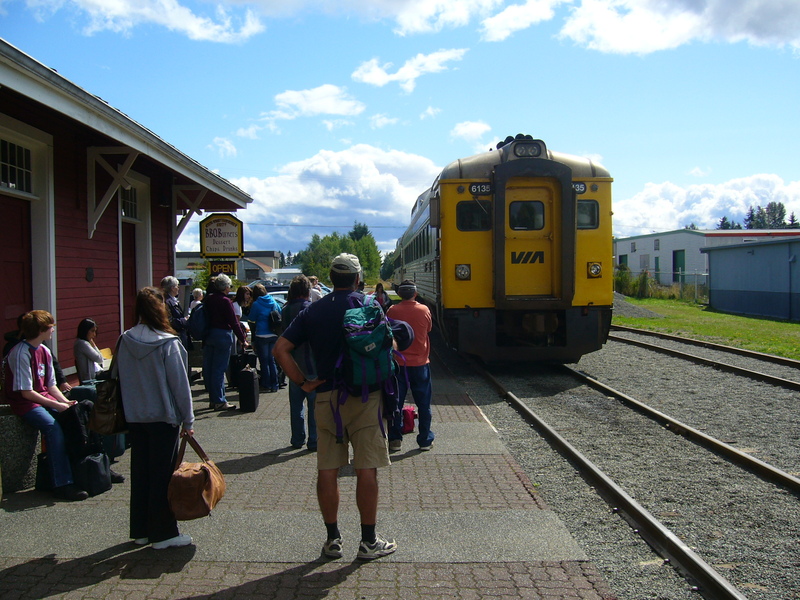 The segment of the line from Parksville to Port Alberni is out of service, although a tourist train operates on a portion of the railway near Port Alberni. One of the main problems with the rail corridor is that right of way is overgrown, tracks are worn out and years of deferred maintenance have taken their toll. Train speeds must be reduced due to the poor quality of the roadbed. This further diminishes the competitiveness of the rail service. The Island Corridor Foundation was hoping to get an investment from senior level governments to upgrade the line so it could support better VIA Rail service, commuter rail in the Victoria area, re-open the Port Alberni line and attract more freight service. It is disappointing to public transport advocates that the province of BC has no problem dropping $24 million on new interchanges (eg. McTavish Rd in North Saanich). The province, with help from the federal government will spend $1.184 billion on the South Fraser Perimeter Road (expressway). These road projects seem to get announced every week with no year-long half million dollar studies, but for non-highway projects the province isn’t interested in supporting them. Someone who agrees with the study conclusions. Obsolete Railway Should be Scrapped. Best Transport System on Earth? No, sorry it is not in Vancouver or British Columbia or anywhere else in Canada for that matter. I think it is possibly in Switzerland. They have built an efficient multi-modal transport system centred around the train, but integrated perfectly with buses and lake ferries. The system runs as they say “Like a Swiss watch” and they aren’t exaggerating. The trains arrive on schedule almost all of the time and a delay of more than 2 minutes will be announced. It is truly a pleasure to travel in Switzerland so easily with no hassles. Travel between any two cities in Switzerland is possible every hour or half hour with easy connections between platforms at main hub stations like Geneva, Bern, Zurich and even smaller stations such as Speiz (near Interlaken). A good way to visit Switzerland is with an 8 day (or less) Swiss Pass which allows unlimited travel with inter-city railways, buses, ferries, and urban transport systems of even smaller cities. Comparing a country with a first-world transport system in a country like Switzerland or Germany, with the under-developed transport system of Canada is unfair. It is order of magnitudes better in Europe; however it is good to know what is out there, so we can aspire to improve things at home. Comments Off on Best Transport System on Earth?